On August 18, 2014 August 17, 2014 By Carole @ From My Carolina HomeIn Cooking, Foodie! You gotta love a man who is secure enough to give you a wicked sharp knife as a gift along with a book on how to use it. I have long known by watching the Food Network and lots of PBS cooking shows that I don’t chop an onion ‘properly’, and maybe I never will. But at least I can now try. 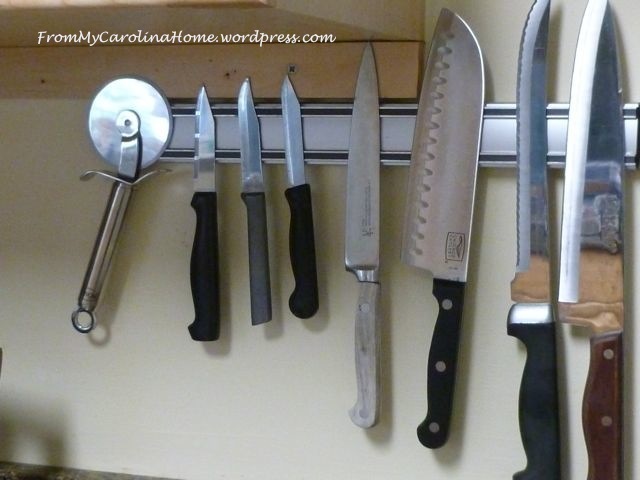 I keep my knives on a magnetic strip on the wall so the edges do not get dulled or chipped in a drawer. That pizza wheel on the left will take your finger off if you aren’t careful. It is another reason I keep sharps on the wall. Last Christmas, my DH surprised me with Mastering Knife Skills. The book came with an instructional DVD too. It is so helpful to see the technique. I learned new things about the high technique and the low technique, based on the size of the item you are cutting. I recently found that there are several great youtube videos by the author Norman Weinstein so you can learn these techniques as well!! Click on High Low Cutting Techniques for an overview. 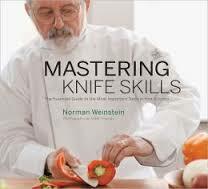 Or check out all the videos by clicking Mastering Knife Skills Videos. There are a number of different knives for different needs. The book covers everything from using a boning knife to making a tomato rose. 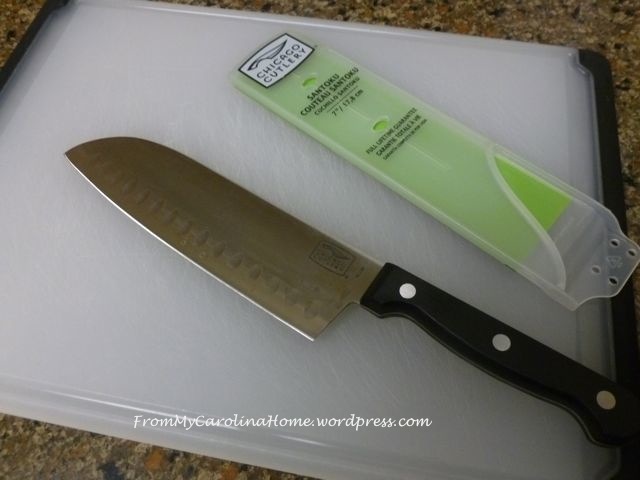 DH gave me a really sharp knife called a Santoku. It has a long, curved, extremely sharp edge. I have been practicing with the right techniques, and I am still not very good at it, but boy is it fun to try. I just have to be careful not to cut my fingers!! So, for my foodie readers, this book is a must for your kitchen library. Check out the videos, and be careful with those sharp knives!! More AQS Show Pearls and a Giveaway!! Seeing what you are going to post next is always fun. I especially like how you switch off from sewing and get into something like this: knife skills! I am very interested in knife skills. Thank you! Thank you both so much!! It is great to know that someone gets a laugh when I am trying to be funny!! You made my day!